Usually referred to as the flu or grippe, influenza is a highly infectious respiratory disease. The disease is caused by certain strains of the influenza virus. When the virus is inhaled, it attacks cells in the upper respiratory tract, causing typical flu symptoms such as fatigue, fever and chills, a hacking cough, and body aches. Influenza victims are also susceptible to potentially life-threatening secondary infections. Although the stomach or intestinal "flu" is commonly blamed for stomach upsets and diarrhea, the influenza virus rarely causes gastrointestinal symptoms. Such symptoms are most likely due to other organisms such as rotavirus, Salmonella, Shigella, or Escherichia coli. The flu is considerably more debilitating than the common cold. Influenza outbreaks occur suddenly, and infection spreads rapidly. The annual death toll attributable to influenza and its complications averages 20,000 in the United States alone. In the 1918–1919 Spanish flu pandemic, the death toll reached a staggering 20-40 million worldwide. Approximately 500,000 of these fatalities occurred in America. Influenza outbreaks occur on a regular basis. The most serious outbreaks are pandemics, which affect millions of people worldwide and last for several months. The 1918–1919 influenza outbreak serves as the primary example of an influenza pandemic. Pandemics also occurred in 1957 and 1968 with the Asian flu and Hong Kong flu, respectively. The Asian flu was responsible for 70,000 deaths in the United States, while the Hong Kong flu killed 34,000. Epidemics are widespread regional outbreaks that occur every two to three years and affect 5-10% of the population. The Russian flu in the winter of 1977 is an example of an epidemic. A regional epidemic is shorter lived than a pandemic, lasting only several weeks. Finally, there are smaller outbreaks each winter that are confined to specific locales. The earliest existing descriptions of influenza were written nearly 2500 years ago by the ancient Greek physician Hippocrates. Historically, influenza was ascribed to a number of different agents, including "bad air" and several different bacteria. In fact, its name comes from the Italian word for "influence," because people in eighteenth-century Europe thought that the disease was caused by the influence of bad weather. It was not until 1933 that the causative agent was identified as a virus. In the United States, 90% of all deaths from influenza occur among persons older than 65. Flu-related deaths have increased substantially in the United States since the 1970s, largely because of the aging of the American population. In addition, elderly persons are vulnerable because they are often reluctant to be vaccinated against flu. A new concern regarding influenza is the possibility that hostile groups or governments could use the virus as an agent of bioterrorism. A report published in early 2003 noted that Type A influenza virus has a high potential for use as such an agent because of the virulence of the Type A strain that broke out in Hong Kong in 1997 and the development of laboratory methods for generating large quantities of the virus. The report recommended the stockpiling of present antiviral drugs and speeding up the development of new ones. Approximately one to four days after infection with the influenza virus, the victim is hit with an array of symptoms. "Hit" is an appropriate term, because symptoms are sudden, harsh, and unmistakable. Typical influenza symptoms include the abrupt onset of a headache, dry cough, and chills, rapidly followed by overall achiness and a fever that may run as high as 104°F (40°C). As the fever subsides, nasal congestion and a sore throat become noticeable. Flu victims feel extremely tired and weak and may not return to their normal energy levels for several days or even a couple of weeks. Influenza complications usually arise from bacterial infections of the lower respiratory tract. Signs of a secondary respiratory infection often appear just as the victim seems to be recovering. These signs include high fever, intense chills, chest pains associated with breathing, and a productive cough with thick yellowish green sputum. If these symptoms appear, medical treatment is necessary. Other secondary infections, such as sinus or ear infections, may also require medical intervention. Heart and lung problems, and other chronic diseases, can be aggravated by influenza, which is a particular concern with elderly patients. With children and teenagers, it is advisable to be alert for symptoms of Reye's syndrome, a rare, but serious complication. Symptoms of Reye's syndrome are nausea and vomiting, and more seriously, neurological problems such as confusion or delirium. The syndrome has been associated with the use of aspirin to relieve flu symptoms. Although there are specific tests to identify the flu virus strain from respiratory samples, doctors typically rely on a set of symptoms and the presence of influenza in the community for diagnosis. Specific tests are useful to determine the type of flu in the community, but they do little for individual treatment. Doctors may administer tests, such as throat cultures, to identify secondary infections. Since 1999, however, seven rapid diagnostic tests for flu have become commercially available. These tests appear to be especially useful in diagnosing flu in children, allowing doctors to make more accurate treatment decisions in less time. Essentially, a bout of influenza must be allowed to run its course. Symptoms can be relieved with bed rest and by keeping well hydrated. A steam vaporizer may make breathing easier, and pain relievers will take care of the aches and pain. Food may not seem very appetizing, but an effort should be made to consume nourishing food. Recovery should not be pushed too rapidly. Returning to normal activities too quickly invites a possible relapse or complications. Over-the-counter medications are used to treat flu symptoms, but it is not necessary to purchase a medication marketed specifically for flu symptoms. Any medication that is designed to relieve symptoms, such as pain and coughing, will provide some relief. Medications containing alcohol, however, should be avoided because of the dehydrating effects of alcohol. The best medicine for symptoms is simply an analgesic, such as aspirin, acetaminophen, or naproxen. Without a doctor's approval, aspirin is generally not recommended for people under 18 owing to its association with Reye's syndrome, a rare aspirin-associated complication seen in children recovering from the flu. To be on the safe side, children should receive acetaminophen or ibuprofen to treat their symptoms. There are four antiviral drugs marketed for treating influenza as of 2003. To be effective, treatment should begin no later than two days after symptoms appear. Antivirals may be useful in treating patients who have weakened immune systems or who are at risk for developing serious complications. They include amantadine (Symmetrel, Symadine) and rimantadine (Flumandine), which work against Type A influenza, and zanamavir (Relenza) and oseltamavir phosphate (Tamiflu), which work against both Types A and B influenza. Amantadine and rimantadine can cause side effects such as nervousness, anxiety, lightheadedness, and nausea. Severe side effects include seizures, delirium, and hallucination, but are rare and are nearly always limited to people who have kidney problems, seizure disorders, or psychiatric disorders. The new drugs zanamavir and oseltamavir phosphate have few side effects but can cause dizziness, jitters, and insomnia. There are several alternative treatments that may help in fighting off the virus and recovering from the flu, in addition to easing flu symptoms. Acupuncture and acupressure. Both are said to stimulate natural resistance, relieve nasal congestion and headaches, fight fever, and calm coughs, depending on the acupuncture and acupressure points used. Aromatherapy. Aromatherapists recommend gargling daily with one drop each of the essential oils of tea tree (Melaleuca spp.) and lemon mixed in a glass of warm water. If already suffering from the flu, two drops of tea tree oil in a hot bath may help ease the symptoms. Essential oils of eucalyptus (Eucalyptus globulus) or peppermint (Mentha piperita) added to a steam vaporizer may help clear chest and nasal congestion. Herbal remedies. Herbal remedies can be used stimulate the immune system (echinacea), as antivirals (Hydrastis canadensis) goldenseal and garlic (Allium sativum), or directed at whatever symptoms arise as a result of the flu. For example, an infusion of boneset (Eupatroium perfoliatum) may counteract aches and fever, and yarrow (Achillea millefolium) or elderflower tinctures may combat chills. Homeopathy. To prevent flu, a homeopathic remedy called Oscillococcinum may be taken at the first sign of flu symptoms and repeated for a day or two. Although oscillococcinum is a popular flu remedy in Europe, however, a research study published in 2003 found it to be ineffective. Other homeopathic remedies recommended vary according to the specific flu symptoms present. Gelsemium (Gelsemium sempervirens) is recommended to combat weakness accompanied by chills, a headache, and nasal congestion. Bryonia (Bryonia alba) may be used to treat muscle aches, headaches, and a dry cough. For restlessness, chills, hoarseness, and achy joints, poison ivy (Rhus toxicodendron) is recommended. Finally, for achiness and a dry cough or chills, Eupatorium perfoliatum is suggested. Hydrotherapy. A bath to induce a fever will speed recovery from the flu by creating an environment in the body where the flu virus cannot survive. The patient should take a bath as hot as he/she can tolerate and remain in the bath for 20-30 minutes. While in the bath, the patient drinks a cup of yarrow or elderflower tea to induce sweating. During the bath, a cold cloth is held on the forehead or at the nape of the neck to keep the temperature down in the brain. The patient is assisted when getting out of the bath (he/she may feel weak or dizzy) and then gets into bed and covers up with layers of blankets to induce more sweating. Traditional Chinese medicine (TCM). Practitioners of TCM recommend mixtures of herbs to prevent flu as well as to relieve symptoms once a person has fallen ill. There are several different recipes for these remedies, but most contain ginger and Japanese honeysuckle in addition to other ingredients. Most people recover fully from an influenza infection, but it should not be viewed complacently. Influenza is a serious disease, and approximately 1 in 1,000 cases proves fatal. The Centers for Disease Control and Prevention recommend that people get an influenza vaccine injection each year before flu season starts. In the United States, flu season typically runs from late December to early March. Vaccines should be received two to six weeks prior to the onset of flu season to allow the body enough time to establish immunity. Adults only need one dose of the yearly vaccine, but children under nine years of age who have not previously been immunized should receive two doses with a month between each dose. Each season's flu vaccine contains three virus strains that are the most likely to be encountered in the coming flu season. When there is a good match between the anticipated flu strains and the strains used in the vaccine, the vaccine is 70-90% effective in people under 65. Because immune response diminishes somewhat with age, people over 65 may not receive the same level of protection from the vaccine, but even if they do contract the flu, the vaccine diminishes the severity and helps prevent complications. The virus strains used to make the vaccine are inactivated and will not cause the flu. In the past, flu symptoms were associated with vaccine preparations that were not as highly purified as modern vaccines, not to the virus itself. In 1976, there was a slightly increased risk of developing Guillain-Barré syndrome, a very rare disorder, associated with the swine flu vaccine. This association occurred only with the 1976 swine flu vaccine preparation and has never recurred. Serious side effects with modern vaccines are extremely unusual. Some people experience a slight soreness at the point of injection, which resolves within a day or two. People who have never been exposed to influenza, particularly children, may experience one to two days of a slight fever, tiredness, and muscle aches. These symptoms start within 6-12 hours after the vaccination. It should be noted that certain people should not receive an influenza vaccine. Infants six months and younger have immature immune systems and will not benefit from the vaccine. Since the vaccines are prepared using hen eggs, people who have severe allergies to eggs or other vaccine components should not receive the influenza vaccine. As an alternative, they may receive a course of amantadine or rimantadine, which are also used as a protective measure against influenza. Other people who might receive these drugs are those that have been immunized after the flu season has started or who are immunocompromised, such as people with advanced HIV disease. Amantadine and rimantadine are 70-90% effective in preventing influenza. As of early 2003, researchers are working on developing an intranasal flu vaccine in aerosol form. An aerosol vaccine using a weakened form of Type A influenza virus has been tested in pilot studies and awaits further clinical trials. Beers, Mark H., MD, and Robert Berkow, MD, editors. "Respiratory Viral Diseases: Influenza." Section 13, Chapter 162. In The Merck Manual of Diagnosis and Therapy. Whitehouse Station, NJ: Merck Research Laboratories, 2004. Pelletier, Kenneth R., MD. The Best Alternative Medicine, Part II. "CAM Therapies for Specific Conditions: Colds/Flu." New York: Simon & Schuster, 2002. Elkins, Rita. "Combat Colds and Flu." Let's Live. 68 (January 2000): 81+. Jonas, W. B., T. J. Kaptchuk, and K. Linde. "A Critical Overview of Homeopathy." Annals of Internal Medicine 138 (March 4, 2003): 393-399. Krug, R. M. "The Potential Use of Influenza Virus as an Agent for Bioterrorism." Antiviral Research 57 (January 2003): 147-150. Oxford, J. S., S. Bossuyt, S. Balasingam, et al. "Treatment of Epidemic and Pandemic Influenza with Neuraminidase and M2 Proton Channel Inhibitors." Clinical Microbiology and Infection 9 (January 2003): 1-14. Roth, Y., J. S. Chapnik, and P. Cole. "Feasibility of Aerosol Vaccination in Humans." Annals of Otology, Rhinology, and Laryngology 112 (March 2003): 264-270. Shortridge, K. F., J. S. Peiris, and Y. Guan. "The Next Influenza Pandemic: Lessons from Hong Kong." Journal of Applied Microbiology 94, Supplement (2003): 70S-79S. Storch, G. A. "Rapid Diagnostic Tests for Influenza." Current Opinion in Pediatrics 15 (February 2003): 77-84. Thompson, W. W., D. K. Shay, E. Weintraub, et al. "Mortality Associated with Influenza and Respiratory Syncytial Virus in the United States." Journal of the American Medical Association 289 (January 8, 2003): 179-186. National Institute of Allergy and Infectious Diseases (NIAID). 31 Center Drive, MSC 2520, Bethesda, MD 20892-2520. http://www.niaid.nih.gov. NIAID Fact Sheet: Flu. Bethesda, MD: NIAID, January 2003. http://www.niaid.nih.gov/factsheets/flu.htm. Bioterrorism — The intentional use of disease-causing microbes or other biologic agents to intimidate or terrorize a civilian population for political or military reasons. Type A influenza virus could be used as an agent of bioterrorism. Common cold — A mild illness caused by a upper respiratory viruses. Usual symptoms include nasal congestion, coughing, sneezing, throat irritation, and a low-grade fever. Epidemic — A widespread regional disease outbreak. Guillain-Barré syndrome — Also called acute idiopathic polyneuritis, this condition is a neurologic syndrome that can cause numbness in the limbs and muscle weakness following certain viral infections. Pandemic — Worldwide outbreak of an infection, afflicting millions of victims. an acute viral infection of the respiratory tract, occurring in isolated cases, epidemics, and pandemics. Called also grippe and flu. adj., adj influen´zal. Three different genera of viruses have been discovered that cause influenza, called Influenzavirus A, B, and C (species names influenza A virus, influenza B virus, and influenza C virus). Influenza B and influenza C viruses are chiefly associated with sporadic epidemics among children and young adults. Most older adults carry antibodies against influenza because of repeated exposure to the viruses. Subtypes of influenza A virus are designated based on the antigens hemagglutinin and neuraminidase; because they can undergo antigenic shift they are responsible for widespread epidemics. Symptoms. Influenza has a short incubation period. Symptoms appear suddenly, and although the virus enters the respiratory tract it soon affects the entire body. The symptoms include fever, chills, headache, sore throat, cough, gastrointestinal disturbances, muscular pain, and neuralgia. Treatment. There is no drug that will cure influenza, but over-the-counter medications may minimize discomfort. Rest, increased fluid intake, and aspirin to relieve aches and discomfort and help control fever are prescribed for adults. Children are also treated symptomatically, but without aspirin. Prevention. A vaccine is available, although it does not always provide complete immunity against all forms of influenza viruses that may be present. In its Guidelines for the Prevention and Treatment of Influenza and the Common Cold, the American Lung Association recommends vaccination for people over 50, pregnant women who will be more than three months pregnant during flu season, residents of nursing homes or other chronic care facilities, and health care providers (the latter because they could transmit the virus to persons in high risk groups). Systemic reactions to the vaccine occasionally occur. Toxic reactions include fever, malaise, and muscle pain within 6 to 12 hours after injection. An immediate reaction can occur as a result of allergic hypersensitivity. In about 10 cases per million vaccinations, Guillain-Barré syndrome occurs. Preventive measures other than vaccination include avoiding contact with persons who have influenza, avoiding crowded places when there is a local epidemic, and observing good personal hygiene to increase the body's resistance. (in'flū-en'ză), The colloquial word flu is often loosely applied to any acute viral syndrome, including gastroenteritis ("intestinal flu"). Influenza, however, is a specific respiratory infection with a well-defined cause, and gastrointestinal symptoms seldom occur. 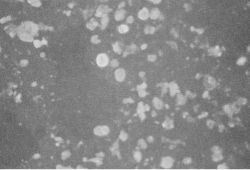 An acute infectious respiratory disease, caused by Influenza viruses, which are in the family Orthomyxoviridae, in which the inhaled virus attacks the respiratory epithelial cells of those susceptible and produces a catarrhal inflammation; characterized by sudden onset, chills, fever of short duration (3-4 days), severe prostration, headache, muscle aches, and a cough that usually is dry and may be followed by secondary bacterial infections that can last up to 10 days. The disease commonly occurs in epidemics, sometimes in pandemics, which develop quickly and spread rapidly; the mortality rate is usually low, but may rise in patients with secondary bacterial pneumonia, particularly in old people and those with underlying debilitating diseases; strain-specific immunity develops, but mutations in the virus are frequent, and such immunity usually does not affect antigenically different strains. Influenza viruses are divided on the basis of antigenic structure into three types. Influenza A virus is principally responsible for epidemics; subtypes of influenza A virus affect birds, horses, and swine as well as human beings. Incidence of influenza B is lower and epidemics are less likely to occur with this virus, for which animal reservoirs are apparently of little importance. Influenza C infection is typically mild or subclinical. The annual mortality of influenza in the U.S. is believed to exceed 50,000, more than 90% of these deaths occurring in people 65 years of age or older. Influenza deaths have increased substantially in the past 20 years, in part because of the aging of the population. At least 30 pandemics of influenza have occurred since 1580. The influenza A pandemic of 1918-1920 ("Spanish flu") caused more than 20 million deaths worldwide, 500,000 of them in the U.S. Less devastating pandemics occurred in 1957 ("Asian flu") and 1968 ("Hong Kong flu"). Influenza is highly contagious. The virus is transmitted from person to person by direct contact and by airborne droplets of respiratory secretion expelled through coughing and sneezing. Incidence is highest in late fall, winter, and early spring. Active immunization with noninfective vaccines containing hemagglutinin (H) and neuraminidase (N) antigens of currently prevalent strains has reduced the extent and severity of epidemics and has provided protection to vulnerable populations such as the elderly. Vaccines are especially recommended for people older than 50 and those with certain chronic conditions, including diabetes mellitus, immune deficiency, impairment of renal function, and cardiac and pulmonary disease. Immunity arising from either natural infection or vaccination confers protection only against certain strains of virus. Antigenic drift results from the gradual accumulation of new epitopes on viral H and N molecules, whereas antigenic shifts are caused by mutations in the genes that encode these molecules. A new strain probably emerges as a human pathogen when that strain is transmitted to human beings from animal hosts. Influenza cannot be diagnosed with certainty or differentiated from other acute febrile syndromes on clinical evidence alone. Diagnosis can only be confirmed by detection of viral antigen in nasal secretions by direct immunofluorescence or by a rising titer of antibody to influenzal hemagglutinin. The antiviral drugs amantadine and rimantadine (effective only against influenza A) and the neuraminidase inhibitors oseltamivir and zanamivir can prevent clinical illness when taken prophylactically during an outbreak or epidemic and can reduce the severity and duration of symptoms (average reduction in duration with all agents, one day) when administered within 24-48 hours after the onset of illness. An international network for influenza surveillance was established by the World Health Organization in 1948. Now consisting of 110 centers in 83 countries, the network monitors influenza activity worldwide, facilitates rapid identification of viral strains, and provides information used in determining the composition of influenza vaccines. Infectious disease A viral infection which costs the health care system–US ± $12 billion/yr; it causes 10-40,000 excess deaths/yr, 80% in the elderly, most preventable by annual vaccination Complications Secondary bacterial infections–eg, otitis media, viral URIs, Reye syndrome, liver and CNS disease Management Oseltamivir, zanamivir, a selective neuraminidase inhibitor, ↓ symptoms in influenza A or B Prevention Annual vaccination. See Cold-adapted influenza vaccine, Zanamivir. An acute infectious respiratory disease, caused by influenza viruses; attacks the respiratory epithelial cells and produces a catarrhal inflammation; characterized by sudden onset, chills, fever of short duration, severe prostration, headache, muscle aches, and a cough that usually is dry until secondary infection occurs. The disease commonly occurs in epidemics, sometimes in pandemics; strain-specific immunity develops, but mutations in the virus are frequent, and the immunity usually does not protect against antigenically different strains. A respiratory infection caused by a virus of the Orthomyxoviridae family and spread mainly by the aerosol of droplets coughed and sneezed by sufferers. It is highly infectious to the susceptible, spreads rapidly, and tends to occur in epidemics in the winter time. There are three main types—A, B and C—distinguishable by antibody tests. Type B is the main cause. Influenza features fever, sore throat, running nose, dry cough, headache, backache, muscle pains, loss of appetite, insomnia and prostration. In most cases the acute stage lasts for only a few days and the symptoms then gradually resolve. Complications include HYPERPYREXIA, BRONCHITIS, PNEUMONIA and REYE'S SYNDROME. There is a significant mortality rate, especially in old people. Vaccines are available and are especially important for the elderly. an acute respiratory disease affecting the upper respiratory tract, with symptoms of fever, chills and generalized aching, caused by a number of influenza viruses, particularly types A and B. Influenza outbreaks occur frequently and can have a worldwide distribution, often being associated with secondary bacterial complications. Over 20 million people died in the PANDEMIC outbreak of 1918–1919, principally young adults who may have been exposed to an unusually virulent form of virus. The virus is subject to considerable antigenic variation. See ANTIGENIC DRIFT, ANTIGENIC SHIFT. n a viral infection trans-mitted via airborne droplets; highly contagious, with a sudden onset of symptoms including sore throat, headache, fever, chills, and myalgia. Recovery normally occurs within three to ten days but can be fatal. An acute infectious respiratory disease, caused by influenza viruses, in which inhaled virus attacks respiratory epithelial cells of susceptible people and produces a catarrhal inflammation; characterized by sudden onset, chills, and other symptoms. n a highly contagious infection of the respiratory tract caused by a myxovirus and transmitted by airborne droplet infection. Symptoms include sore throat, cough, fever, muscular pains, and weakness. Fever and constitutional symptoms distinguish influenza from the common cold. Three main strains of influenza virus have been recognized: Type A, Type B, and Type C. New strains of the virus emerge at regular intervals and are named according to geographic origin. Asian flu is a Type A influenza. n an active immunizing agent prescribed for immunization against influenza, generally recommended for at-risk populations, such as the elderly. an acute viral infection of the respiratory tract, occurring usually in epidemics, and pandemics. 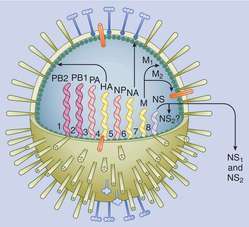 Influenza viruses are single-stranded RNA viruses belonging to the family Orthomyxoviridae, which contains three genera termed A, B and C. All of the viruses of interest to veterinarians are influenza type A viruses and include those causing equine influenza, swine influenza and avian influenza (fowl plague). Common usage is to diagnose influenza or 'flu' in many nonspecific respiratory infections in animals or those caused by other viruses, but this is etiologically incorrect. Typical examples are cat flu and goose influenza. Q. INFLUENZA(FLU) is it a fatal disease? A. depends. as you may already know- the flu virus changes every year (this is why the vaccine is only good for a year)a little bit. but every now and then (about every 80 years) the change is really big and most people are not vaccinated at all. then it reeks havoc in the world. last time it happened called the "spanish flu",they say 25,000,000 people died the first 25 weeks. Q. How flu is passing? I have too small children, and in the class of the older one there’s an outbreak of flu with many sick children. The last time my little son had the flu was like a hell for him, and I really won’t to prevent it. What can I do? A. The virus (the creature that cause flu is spread in secretions from the nose, mouth etc, and children may be infective even days before they actually have visible disease. However, simple measures, such as covering the nose and mouth while sneezing or coughing and washing hands thoroughly may minimize the transmission of the flu from child to child.